The Torchlight developer's CEO says that he isn't especially keen on trying to take on World of Warcraft. The Torchlight MMO is still coming, and won't have subscription fees. That's the word from developer Runic Games' CEO, Max Schaefer, who says that the project is still quietly bubbling away, despite sequels and Xbox Live ports taking up the team's time. 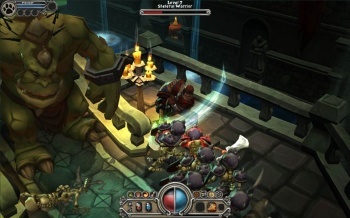 Schaefer said that the Torchlight MMO would be different from what people might expect an MMO to be like, adding that Runic had no intention of making a cookie cutter game. He said that the studio took a broader view of what an MMO was, rather than the fairly narrow definition that a lot of people seemed to have. He said that Runic wanted to keep the game fairly low-tech so that it could run on as many computers as possible and also to make it easy and quick to make new content. He was clear, however, that Runic wasn't about to try to compete with the big dog in the MMO market, World of Warcraft. Schaefer said that you couldn't think about a MMO project without taking WoW into account. In fact, the reason that Runic wasn't looking to charge a subscription for the Torchlight MMO was because that it felt that anyone who was willing to pay a subscription was already doing so for WoW. Interestingly, Blizzard itself was saying only a few days ago that there was room for another subscription based game alongside WoW, but it's hard to blame developers for being cagey about taking the chance.